The myelin sheath is found surrounding axons of the both the central and peripheral nervous system. Axons may be myelinated or unmyelinated. In myelinated axons the sheath is arranged with small gaps known as the Nodes of Ranvier, this is where the action potentials are generated as this is where the majority of the axon’s ion channels are located. This article shall discuss the myelin sheath, its affect on transmission of signals in the nervous system and relevant clinical conditions. Myelin is a lipid-rich substance that surrounds some axons within the central and peripheral nervous systems. The sheath is formed from wrapping of multiple layers of cell membrane (lipoprotein) from the myelin-producing cells. In the central nervous system (CNS) these cells are the oligodendrocytes, and in the peripheral nervous system (PNS) these cells are known as Schwann cells. A single oligodendrocyte can myelinate up to 50 axons, however Schwann cells are only able to myelinate a single axon. Individual Schwann cells can each cover around 100 micrometres of an axon – meaning that it takes around 10,000 Schwann cells to myelinate a one-metre length of axon. The gaps left between Schwann cells (and between areas of myelination in the CNS) are known as Nodes of Ranvier. Little is known about the exact process of myelination, however it begins in utero – early in the third trimester. Although there is very little myelin present at birth, during infancy it progresses rapidly, in line with the development of various cognitive and motor skills. 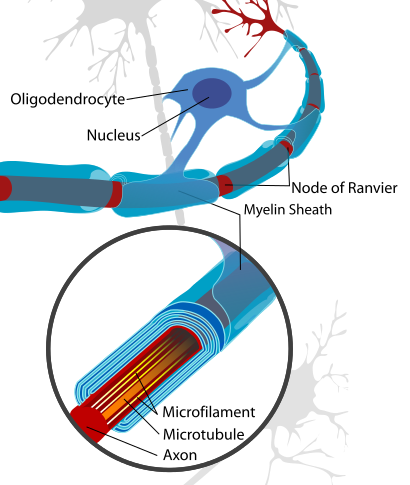 Myelination continues throughout adolescence and into early adulthood, following which the process is largely complete. Fig 1 – Diagram showing the myelin sheath surrounding an axon in the CNS – with associated oligodendrocyte. The myelin sheath gives axons certain properties that increase the speed at which they are able to conduct action potentials. Resistance– the degree to which a membrane prevents or facilitates free movement of ions; a low resistance membrane allows lots of ion movement, and a high resistance membrane does not. This occurs because the myelin sheath inhibits ion movement along the insulated area of the axon, encouraging the diffusion of ions along the axon to reach the next node where the high concentration of ion channels enables rapid depolarisation and action potential generation. Capacitance– the ability of an electrical system to store charge or the charge required to initiate an action potential/electrical impulse; the low capacitance given to an axon by myelination means that a lower change in ion concentration is required to initiate an axon potential. Therefore myelinated axons are able to conduct action potentials much faster than unmyelinated axons via saltatory conduction, where action potentials appear to ‘jump’ between Nodes of Ranvier. 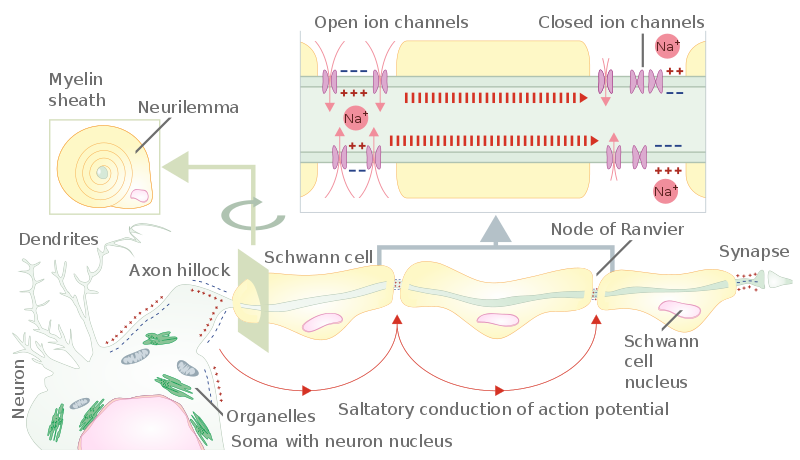 Fig 2 – Diagram to show how the myelin sheath results in saltatory conduction of an action potential along an axon. Guillain-Barré Syndrome is a rapid onset of muscle weakness caused by autoimmune damage to the peripheral nervous system. The cause is unknown, but the underlying mechanism is damage to the myelin sheath of peripheral nerves by the body’s immune system. Initial symptoms usually include changes to sensation or pain and muscle weakness. These begin distally in the feet and hands and then typically spreads proximally to the arms and upper body. The symptoms develop over varying time frames, from hours to over a few weeks. In the acute phase the disorder can be life threatening if the respiratory muscles are affected – this requires mechanical ventilation. Treatment is with supportive care, plasmapheresis and intravenous immunoglobulins. Whilst there is a good recovery in the majority of cases it can take weeks to years, and around a third of patients have some remaining weakness.